It's true what they say, all good things must come to an end. This is no exception for the final season of Wagnaria. This anime was just a random pick for me a few years ago and much to my surprise who knew that an anime following the lives of people working at a diner could be so damn good? 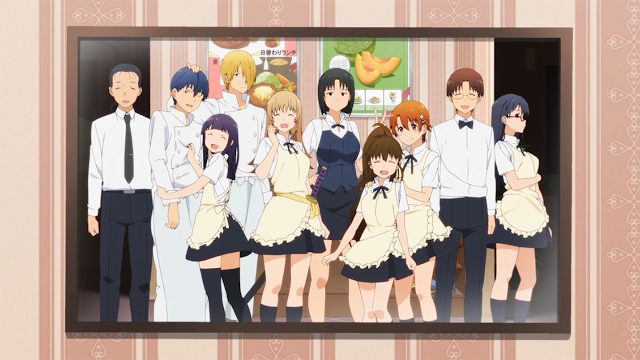 Just seeing the Wagnaria diner at the start of the first episode, getting a refresher of everyone's personalities within the first two minutes through Popura's view and Popura saying, "Welcome to Wagnaria," made me smile from ear to ear- if you've already seen the first two seasons you'd get how charming and unique everyone is. Having said that, it's the same old same old, as the series continues following the employees of Wagnaria going on about doing what they do. Not to give off the impression that the anime is bad, on the contrary it's quite entertaining and very well done. Just that there's no change in the story whatsoever, what you get from the first two seasons is what you get with this final one- maybe even a bit more. I went into this season with expectations that certain storylines that have been dragged on and on within the first two seasons would come to a close. And thank God the season did just that. That weird love triangle between Popura, Inami and Takanashi finally burnt out- and the outcome was not a favourable one for me. Souta finally grew a backbone, him and Yachiyo resolved that one sided love for the past two seasons. Yamada finally meets up with her brother (sorry for the spoiler but I mean... that one was pretty obvious). And Souma... well Souma's just there doing what he does best... being shady... and I love him for that... haha! Hats off to Takatsu for creating a very good slice of life and A-1 for bringing it to life. It's amazing how a food hungry manager, an androphobe, a run away kid, a troll, a cheery pipsqueak, a Kyouko devotee, a timid lover and Takanashi (sorry you get no nickname) were thrown together and somehow Takatsu made magic with that unusual recipe of characters. For some reason the slice of life genre rarely fails me as a viewer and Working is a slice of life done well. I'm very satisfied that I invested my time into this series. The anime is more than a story following the lives of people working at a diner- each one of these characters had their own flaws. It was great seeing everyone sort of close off a chapter in their lives with Takanashi, even Shouma, playing devil's advocate to help everyone solve whatever issues they had. The final episode was very bittersweet for me. So my final thoughts: Popura brought in that charm and cutesy aspect to the show, Shouma and Yamada brought in the comedy, Inami rubbed me the wrong way with her androphobia which got on my nerves here and there, Yachiyo and Souta brought in the romance, and Takanashi was the glue to everything together. I need an anime to sort of give me that petite rollercoaster experience where the anime in that sense gets me riled up and make me smile/laugh and Wagnaria delivered just that. Wagnaria was all in all just a phenomenal anime. Go watch it if you haven't seen it yet, it's nothing too serious so don't expect it to be. Yeah.. so...that's it for this review. I slightly updated this review after the finale special was released, so this review also encompasses the episode 14 special; if you have not seen that special go watch it! And yes I'm still alive, I just wanted to post something real short... since I haven't posted in a minute. I've been consumed with work and school that it's been hard to write. I'll be preparing reviews and posts beforehand during my holiday break so I can hopefully post stuff at least once a week during the next school semester. Thanks for reading and stay tuned! Thanks for reading. And yes I cannot wait for that 1 hour special, it's going to be good!